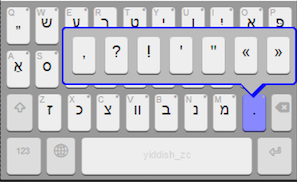 Im my last post (Ideal Yiddish Keyboard), I talked about the Yiddish Pasekh Keyman keyboard layout and how it represented (to my thinking, at least) the ideal keyboard layout for typing Yiddish. Also, since it was supported on Windows, Internet browsers, Linux, iPhone/iPad, Android, and Mac platforms, it was available everywhere. Unfortunately, the iPhone/iPad version of the keyboard had one major limitation: since it was a direct port of the desktop keyboard layout, the keys were a bit small and crowded on the smaller iPhone/iPad devices as the keyboard added a 4th row of keys for the numbers and it attempted to squeeze 52 keys (as is the case on Desktop keyboards) instead of the usual ~33 keys on iOS keyboards. So, in order to make a better Yiddish keyboard for iOS, I created my own Yiddish-ZC layout for iOS devices. 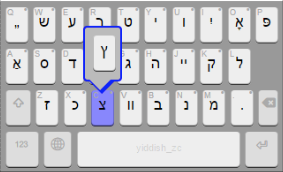 The Yiddish-ZC layout retains most of the nice layout choices of the Yiddish Pasekh keyboard but it is optimized for use on small phone/tablet devices. 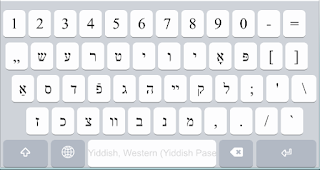 Install the Keyman app for iPhone/iPad from the Apple App Store (you can choose either the Free or the Pro version but the Pro version is needed if you want to be able to use the Yiddish-ZC keyboard as a system keyboard which will be available in any other app). Using the Safari app on your iPhone/iPad, touch this link. 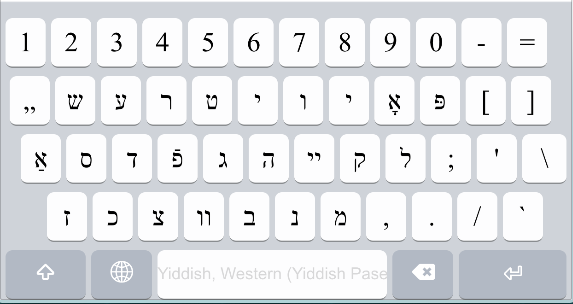 That will automatically open the Keyman app that you downloaded in step #1 and ask if you want to install the Yiddish-ZC keyboard. Just touch the Install button and the keyboard will be installed. 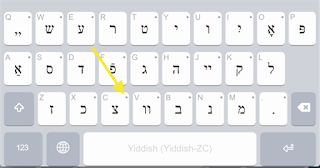 If you downloaded the Free version of the Keyman app in step #1, then you will be able to use the Yiddish-ZC keyboard only within the Keyman text editing app. If you downloaded the Pro version of the Keyman app is step #1, then you will be able to use the Yiddish-ZC keyboard in any app. 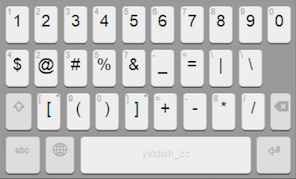 Update-25-Jul-2015: I was told by someone with an Android device that my Yiddish-ZC keyboard works well on Android devices as well! I have no way to test it (I don't use Android devices); however, the above 2 installation steps should work fine with one change - download the Keyman App for Android in step #1. Also, in step #2, you should use the Google Chrome browser (some of the Android browsers won't work with the link but the Google Chrome browser does). 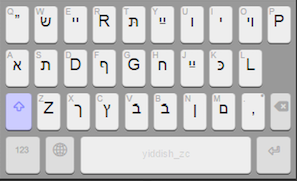 Update-3-Sep-2015: The keyboard has now been updated to automatically fill in Yiddish "final form" characters where appropriate. This will automatically convert any of the following characters: "כנפֿצ" to their final form equivalents: "ךןףץ" if the character is not followed by another Yiddish character. In order to use this functionality you must re-download the keyboard as well as install the latest version of the Keyman app. You will also need to power down and restart your device after re-installing the app. Posted by Ze'ev This entry was posted on Friday, July 24, 2015 at 7/24/2015 01:09:00 PM You can skip to the end and leave a response.